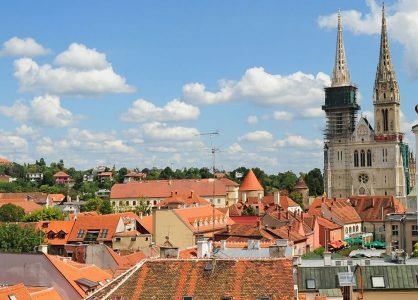 As one of the smaller capital cities in Europe, Zagreb compensates for its compact size with its abundance of interesting artifacts, fascinating history and colourful culture. The city has a high concentration of museums and a vibrant artsy vibe. The streets are decorated with captivating and thought-provoking street murals that blend into the environment and create a unique showpiece. Many local artists design their contemporary works of art to incorporate unused and neglected areas and items. 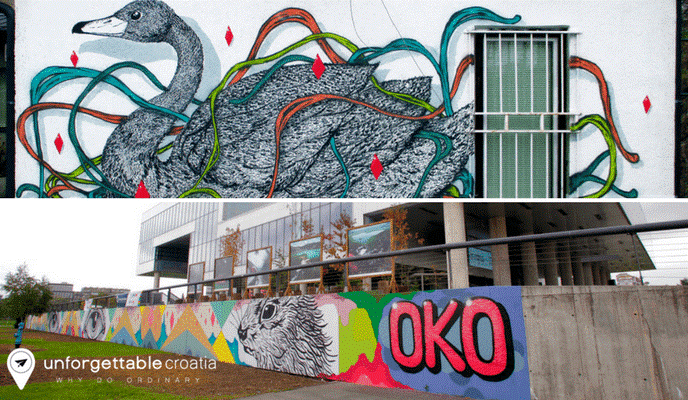 Take a walk around the city and discover Zagreb’s street art style for yourself. We recommend taking Zagreb in as part of a Croatia twin or multi-centre holiday. It is ideally situated for a day trip to the stunning Plitvice Lakes National Park. 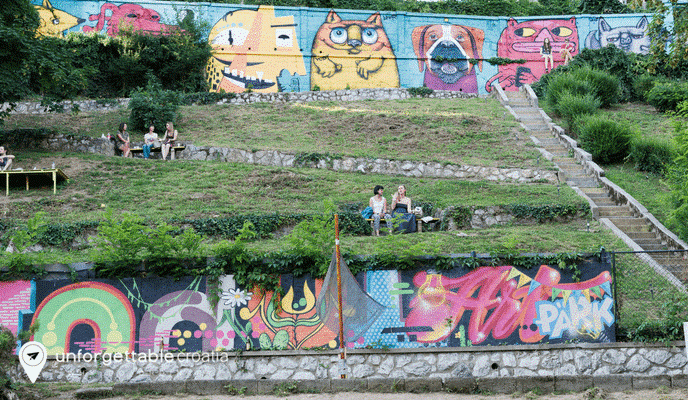 Zagreb’s colourful street art treasury isn’t displayed on the walls of the famous museums and galleries. The artistic murals cover a variety of surfaces in different locations all around the city. Some of local artists have decorated derelict sites with oversized and highly detailed murals that bring the space back to life. Other artists choose to paint their distinctive designs in accessible spaces to create a unique and free open-air ‘exhibition’. All of the street artists have their own creative style. 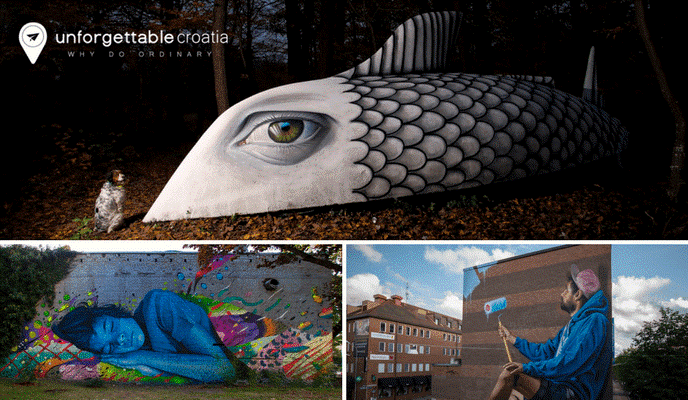 Be prepared to wander off the tourist trail to go in search of Zagreb’s street art. On the city’s brick and concrete surfaces you’ll discover art that challenges your thinking and opens up your mind. Lonac’s distinctive murals are carefully painted over a long period of time. 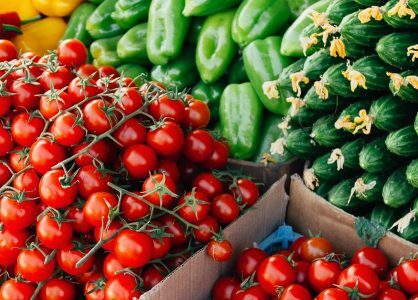 If you explore Zagreb’s Tuškanac forest you will discover a colourful feature in the heart of it. The mural is called (Un)natural Habitat – Big Fish and uses an old boat as a canvas to create an unusual oversized fish. Lonac’s use of spray can paint transforms the surface of any structure and its surroundings. Unattractive pipes become a distinguishing feature that is part of the mural. Lonac is well known for his monumental photo-realistic murals that are highly recognisable. You can see his street art on the side of buildings around Zagreb. Lunar is considered to be one of Croatia’s pioneer street artists. He has painted over 2,000 works of art and has exhibited them around the world. He has a versatile technique and distinctive motifs that usually incorporate animal and flora designs. Lunar’s colourful and playful artwork can be found inside a public garage and out on the streets. Some of the motifs even liven up the exterior and interior of Zagreb’s pubs and bars. 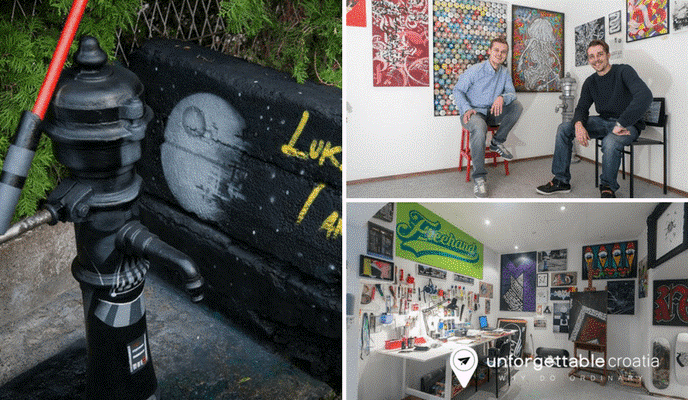 Established street artists Boris Bare and Miroslav Petković Modul opened the small studio Lapo Lapo to create a gallery space for modern art. Catch a glimpse of them at work when you pop along to the studio, and sign up for free graffiti lessons. Around the outskirts of the city you can spot street water pumps that feature original Bare designs that transform the functional forgotten pump into Darth Vader, Lou Reed or Picasso. Modul’s unique artistic style of calligraphy adds a visual embellishment to the exterior façades of buildings. Not all street artists are guys. OKO shows off her unique street art style on façades all over the city. Her early works date back to 2005. Elaborate black-and-white drawings of animal-headed people and distinctive characters typify OKO’s artistic preferences. OKO’s 90m long mural on the west-facing façade of the Museum of Contemporary Art is easily accessible. Her modern designs show off classical influences that have made this street artist a regular feature in London and New York museums. Combine a couple of nights in Zagreb with a Croatia island-hopping cruise. Our Croatia small cruise ships have a maximum capacity of just 40 passengers. Cruise Croatia in style with half-board, modern, en-suite cabins and friendly, professional service. Thanks to the artists’ blogs for the images. 3oko.blogspot.co.uk, lunar75.com, lonac.blogspot.com, and also to croatiaweek.com.